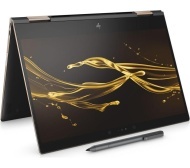 alaTest has collected and analyzed 456 reviews of HP Spectre x360 Core i7 8th Gen - (16 GB/512 GB SSD/Windows 10 Pro) 13-ae503TU 2 in 1 Laptop(13.3 inch, Dark Ash SIlver, 1.26 kg). The average rating for this product is 3.8/5, compared to an average rating of 4.1/5 for other products in the same category for all reviews. Reviewers are impressed by the keyboard and design. The size and portability also get good feedback. The touchpad and energy efficiency get critical comments, and reviews about the durability and battery are mixed. We analyzed user and expert ratings, product age and more factors. Compared to other products in the same category the HP Spectre x360 Core i7 8th Gen - (16 GB/512 GB SSD/Windows 10 Pro) 13-ae503TU 2 in 1 Laptop(13.3 inch, Dark Ash SIlver, 1.26 kg) is awarded an overall alaScore™ of 85/100 = Very good quality. Fast and lightweight. Amazing machine. Runs my high end engineering software no probs. Fabulous laptop, my daughter is a student nurse , uses it for uni. Fab size, light for her to carry about, she loves it because it also looks lovely. Super quick. Fantastic screen. Good keyboard. A couple more thunderbolt ports would be nice and the battery won't last out all day under constant heavy use (but then I don't think many small laptops would). Great battery, power and versatility with the screen flipping over and touch. No Ethernet port as standard. Due to lightness almost feels flimsy. It didn’t do what I was told it would do. Was not fit for purpose. Couldn’t watch Netflix without constant flickering screen. Really annoying. Excellent laptop. Can be switched on and on the internet within seconds. Lovely screen. Perfect for everyday use. Can get a little bit hot when sat on your lap. The fan is a little bit noisier than I would have expected.